The decade from 2005 has been witness to unprecedented change in banking and financial services. How has the City’s employment landscape changed over this decade, not just in terms of raw numbers but also in terms of culture and skills? Has London’s pre-eminence as a global financial centre been threatened by the rise of new markets in the East, particularly Singapore and Hong Kong? This report brings together robust data from one of the City’s leading financial services recruiters with expert views from those at the sharp end of hiring and shaping the financial services workforce of the future. Morgan McKinley has been collecting and publishing monthly data that show both the numbers of professionals seeking new roles in the City and numbers of open opportunities. The London Employment Monitor is now ten years old. “It is evident that the last decade has been one of two extremes,” says HakanEnver, Operations Director, Financial Services for Morgan McKinley. “This in-depth review of our data shows us how the financial crisis didn’t just deliver a single blow to hiring activity in 2009, but has also continued to affect both numbers of jobs and those professionals seeking to move during the subsequent period. 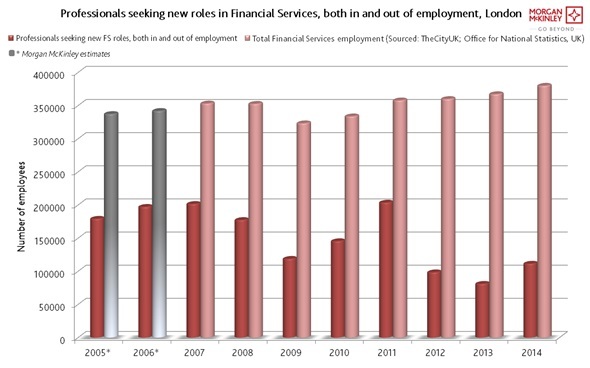 During the period 2008 and 2009, there was a sudden wave of job losses and hiring freezes that brought an end to a decade of continual annual growth in London’s financial services and business services sector, reported to be 6% per annum. It is evident from our data that from as early as 2007, the number of job opportunities available was decreasing. The catalyst for the numbers to fall even further was back in August 2007, when BNP Paribas terminated withdrawals from three hedge funds citing “a complete evaporation of liquidity“. A bubble had formed in the market and with many banks heavily invested in US mortgages, suddenly found themselves at huge risk of loss. Within weeks, there were the well reported queues outside Northern Rock branches, the first run on a leading UK bank for over 200 years. In 2008/9, the Treasury injected £37 billion of new capital into Royal Bank of Scotland Group PLC, Lloyds TSB and HBOS PLC, to avert financial sector collapse. Compliance hiring fluctuated until 2010, when the first wave of new regulations such as Dodd Frank saw hiring steadily increase once again. Further new regulations such as MiFID 2, EMIR, AIFMD and RDR and large anti money laundering sanctions and fines dealt by the regulator and US Treasury’s OCC saw firms’ compliance teams grow to unprecedented levels by 2013 and 2014. Some jobs simply moved home. “We can see how over this period, there was a migration of roles – especially middle and back office roles – from west to east. Now, we see those roles moving back from Singapore and Hong Kong to the UK and US as economic recovery gains momentum” says Richie Holliday, chief operations officer, Morgan McKinley, Asia Pacific. The changing balance of global economic power has also shifted in this time-frame from west to east, and this has affected client-facing specialisms. “We have seen private wealth management move from its traditional homes in London, Switzerland and New York to China where new wealth is seeking a more sophisticated financial platform,” reports Andrew Evans, chief operations officer, at Morgan McKinley, South Asia. Additionally, not all roles are suited to US and European natives keen to take an international assignment. “In China to be successful in private client work, you must be native, a fluent Mandarin speaker, so there is a limited talent pool,” says Evans. Gordon Gecko’s infamous assertion that “Greed is Good” has been widely blamed for fuelling the financial crisis and putting the brakes on bonuses has been a regulatory priority, particularly in Europe.In October, 2008 Gordon Brown declared, “The day of big bonuses is over,” but was he right? In 2013 the EU passed legislation that would cap bonuses at 100% of salary. The UK has vehemently opposed moves to cap pay, arguing that it will lead to a talent drain and reduce the City’s competitiveness in the global talent battle as rival jurisdictions (New York and Singapore, for example) can pay star performers what they like. Many believe fixed pay will also increase compensation considerably. 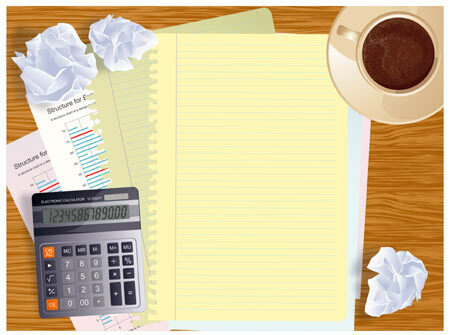 Banking culture – has it changed? According to the CCP Research Foundation, between 2009 and 2013 the global banking industry managed to incur £166bn in fines, settlement fees and provisions. Many of the largest fines represented in this figure relate to the underlying causes of the financial crisis itself – sub-prime mortgage backed securities, for example. But, as Libor rate manipulation and FX market fixing shows, banking culture does not appear to have changed as much as it needs to. She says women hired for senior positions are quizzed on their ability to cope. “The implication is that women have to adapt, not that the culture or environment will change,” says de Angelo. Morgan Stanley for example, has a wide range of recruiting events some of which are exclusively for women. These are presented in collaboration with the firm’s internal networking groups as well as non-profit partners in the interbank community. Murphy sees diversity as an absolute hiring priority too. “We want to see women on all of our shortlists, whatever the role,” he says. “We have been committed to diversity for a long time. We have focused our efforts on bringing high numbers of women into banking at graduate level, but, as with all organisations our efforts now are focused on developing and promoting women through the organisation to create successful role models. ‘We as recruiters recognise the huge value we can and need to add here. We use our expertise and resources to source talent from multiple channels and this plays a vital part in supporting our clients’ search for an increasingly diverse work force’ says David Leithead, Managing Director of Morgan McKinley, London. London’s long history of international trade, the strength of its deposits, equity trading and fund management, continues to place it at the forefront of global finance. Enver says, “London continues to be an attractive place to live and work for high-achieving professionals. Many institutions are committed to growing their presence both domestically and internationally, investing in core and profitable functions. Banks have gone back to basics, looking at their strengths and building on those, whilst assessing their weaknesses and minimising them. “Ongoing regulation is helping to make the banking industry a safer place, by ensuring more robust contingency plans are in place. By holding more capital and a sufficient level of liquid assets, enhancing their risk management systems and reporting financial positions accurately and efficiently, banks hope that are now able to withstand tough shocks to the system and thus limit systemic risk in the market. “The talent pool required to drive many business units has changed, with strong technical knowledge, deep regulatory awareness and more often than not, a minimum of one European language, being preferred. Shortly after the crisis, when banks cut back on their graduate hiring, they have since increased their appetite to recruit at this level. An increase in 2014 in the number of jobs, compared to 2013, clearly suggests a return in confidence to the market, but there still exists some uncertainty as we head into 2015. The recent crash in oil prices, geo-political risks – particularly Russia/Ukraine, ongoing volatility in the Eurozone (including a potential Grexit), as well as continued cyber threats to the banking industry, are a few concerns that could displace London’s foothold as a leading financial centre.